Being a single mum and trying to stay healthy is really hard...when you are tired our of your mind its so easy to hit up the packet of chocolate teddy bear biscuits over an apple...or soft drink over water. Simple take a 90sec microwave bag of brown rice (Coles have one at $1.00, there is a really good one from sunrice with brown rice and quinoa but thats around $3.28) A small bag of frozen veggies (Bag of 5 is around $5). 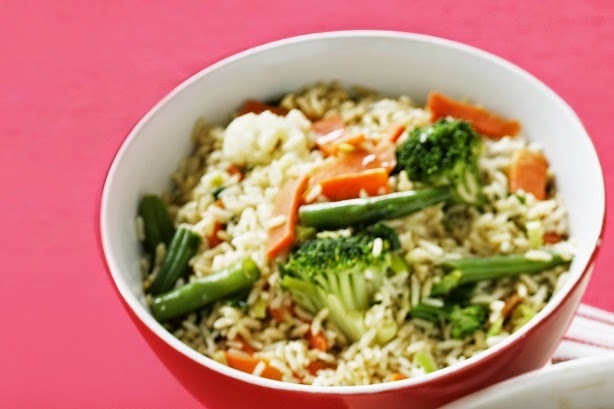 Pop the veggies in microwave to steam then add to a fry pan with a bit of oil and garlic. Cook the rice in the microwave and add when ready. Stir in soy sauce for a minute whilst stirring veggies through and bang you are done! Now there are many alternatives, you could buy bulk packets of frozen vegetables and create your own portions. You can make more rice and creates serves for the rest of the week. You can add meat by cooking that up in the pan prior to the veggies and get that added protein and iron. Oh and that soft drink you are craving...try mineral water (75c Coles Home Brand 1.25 lt) with a slice of lemon! Yum!